Khirbet ‘Anab el-Kebir lies about 5 km southwest of the town of Dhahirieh in the southwestern Hebron Hills. The site should be identified with ‘Anab in the territory of the tribe of Judah ( Jos. 15:50 ), and with ‘Ανάβ, which is listed in the Onomasticon of Eusebius as a village on the border of Beth Guvrin. The ruins extend around the summit at roughly 600 m above sea level and consist of building remains, hewn caves, water cisterns, and various agricultural installations. The northern sector of the ruins is currently inhabited. Some 300 m northeast of the ruins are the remains of a Byzantine church. The church was built on a raised and exposed stone surface at elevation 610 m above sea level. Roughly 50 m to the north of the church, on the same stone surface, a hewn grave and agricultural installations, including both a winepress and an oil press, were found. 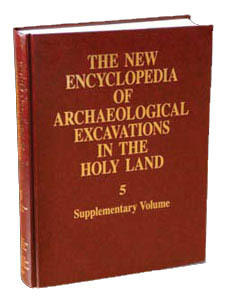 In 1997, salvage excavations were carried out in two caves east of the site, and in 1997–1998 the church was excavated by Y. Magen, Y. Peleg, and I. Sharukh of the Staff Officer for Archaeology in Judea and Samaria. ARCHITECTURE. The church is a basilica (external dimensions, including the apse, of 38 by 20 m) with a central, external apse protruding from the east end of the building. The complex is divided into four sections: an atrium, a narthex, a main hall terminating at the eastern end in an apse with two small rooms on both sides of the bema, and a northern wing.